Here writer Marc Lefkowitz writes about a residency program he undertook with his family at TJinCHINA, a cross-cultural program that got its start in Bejing and has found a new home base in Tijuana, Mexico. 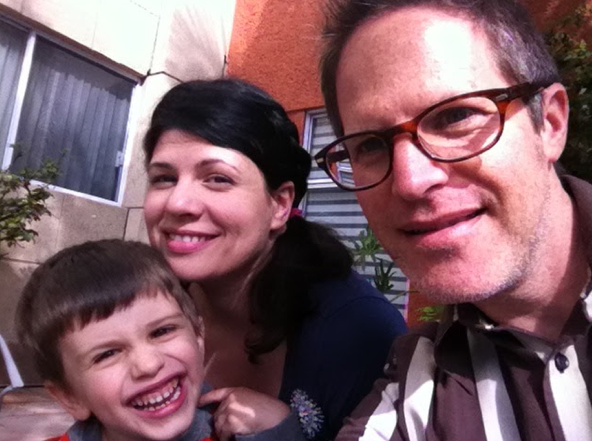 I blog about sustainable urbanism for a living, and my wife Corrie Slawson, is a visual artist, and, with our three-and-half-year-old son, Ira, in tow, we participated in a creative residency at the TJinCHINA Project Space in Tijuana, Mexico this past March. 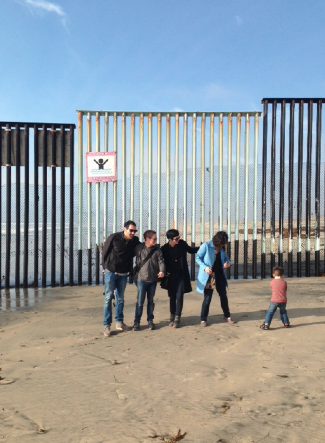 We had to confront prejudices about Tijuana before we even boarded the plane, formed mostly from people’s reactions when we told them where our family was going, and from what we read in blogs, travel books and the like. Many stoked fears of gang violence and ugly partying. If that Tijuana still exists, we never found it. 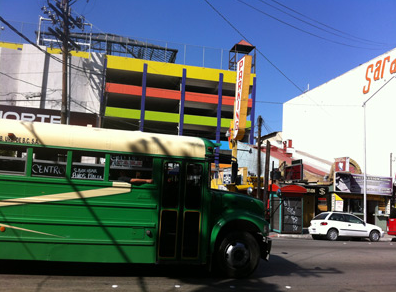 We were inspired by Tijuana’s resiliency, its amazing food, light, and creative community. There’s a lot of creative capital in Tijuana, as in our own city - Cleveland - that tends to be undervalued by civic leaders and overshadowed by other concerns. Like many cities of the West, Tijuana was built around the needs of the car, so our walks in the main areas -- zonas Rio and Centro and our wonderful little neighborhood, Cacho -- became an important ‘minority report’ on how the city operates for the pedestrian, in particular, the family pushing a stroller. TJinCHINA invited us to make work opening new borders. And we found plenty of moments where Cleveland and Tijuana are on or crossing similar “borders.” I found that our cities have in common small groups trying to deal creatively with the environmental damage of sprawl. For example, environmental groups are trying to reclaim rivers and restore the green space in the center. Tijuana native and Director of Woodbury University (San Diego) Graduate School of Architecture, Landscape + Urbanism, Rene Peralta, whom I interviewed, calls it “a set of green lungs” for the city. I wrote about this and other pioneers in “urban ecology,” like Oscar Romo, professor of urban planning at the University of California-San Diego and founder of Alter Terra, which is turning Tijuana’s trash problem into infrastructure like roads, walls, and stormwater containers. making meaningful connections with other artists / urban planners and bringing a new energy related to our family life as working artists home with us. Without irony, I say being together 24/7 in one room pushed us together. And while it sounds like cramped quarters, it was a nice break from how we operate at home, where I report to an office and Corrie holds together a complex web of jobs, family ties and her own studio practice. The residency drove home how relatively easy it is for the parent who reports to an office every day (me) to schedule creative time, versus the daily struggle of the artist/parent who works from home and manages studio time along with part-time jobs and preschool carpools (Corrie). 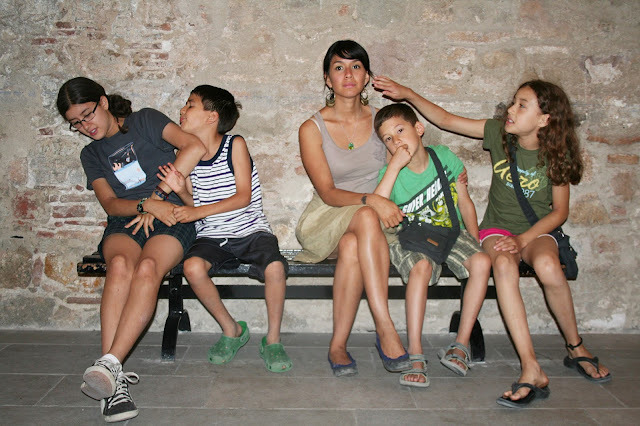 What a family residency provided was more life-work balance and more time of discovery together. Since my work consists of interviews and field trips followed by creative time in front of the computer, I could count on writing time at night after Ira went to bed. 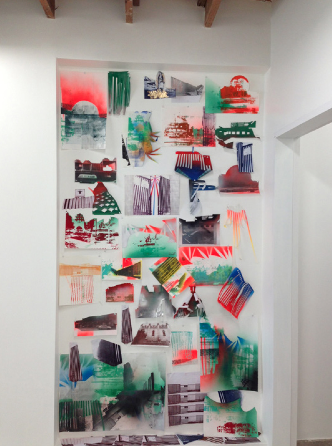 Corrie found many ways of adapting her work to available materials, early on, she worked in the hotel room to render parts of drawings on the computer at night, prepping source material for her work in the studio the next day. Stroller trips to Office Max to make copies for paper lithography and the Comex (Mexico’s Sherwin Williams) store on the route down Boulevard Agua Caliente to purchase paint for her mixed media work meant that no moment was “wasted”. On days when I had to write and Corrie was in the middle of a piece, we took turns walking Ira to a city park like Parque Teniente Guerrero, which had a big playground and an open mike area (where you could catch an abuelita singing or, if you’re lucky, a spine-tingling set from performance artist, El Muerto). Part of the experience was pushing ourselves to places that we might not otherwise have visited. 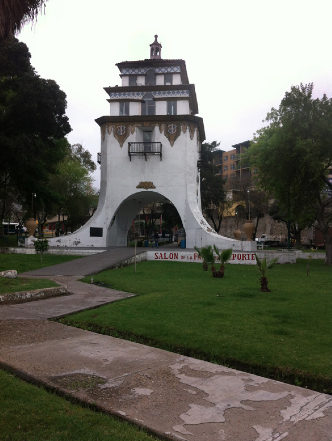 It provided a window into another side of the city, namely what it offers families. For example, we got our day started walking and talking while Ira played at CECUT, Tijuana’s massive and free art, botanical garden, performance, kids activity complex. We appreciated it, but also grew to understand the need in Tijuana for more green space. It brought this into frame even before interviews, like my conversation with landscape designer Armando Ramos, who is fighting for a central park in Tijuana. 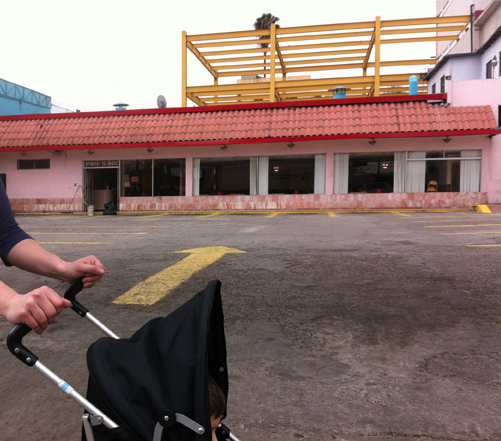 stroller at restaurants where even the loudest norteña band and the best ceviche in the world couldn’t rouse him. Ira was really comfortable in the project space, and got to see a lot more of what mommy and daddy “do” in their work. This sort of connection and cultural exchange is a rare gift, and we’re thankful to artists and project space founders Mely Barragan and Daniel Ruanova for their great efforts to make us feel welcome in their home and in their city, and for funding from the Mexican Government that made the residency possible. Corrie created an entirely new body of work in response to the city, and I wrote a series of articles based on interviews and research conducted over three weeks. Our work is currently in the exhibition “Urbanscape from a Bizarre Present” at the TJinCHINA Project Space, along with work by three other artists based in Baja and southern California. Writer Marc Lefkowitz merges reporting and activism with a focus on sustainable resource use, compact settlement patterns and low-carbon transportation as an equity issue. Marc is the editor of Green City Blue Lake at the Nonprofit Sustainability Center within the Cleveland Museum of Natural History. He also works collaboratively with his wife, visual artist Corrie Slawson, who interweaves realism and abstraction to examine development patterns, population loss and land use. 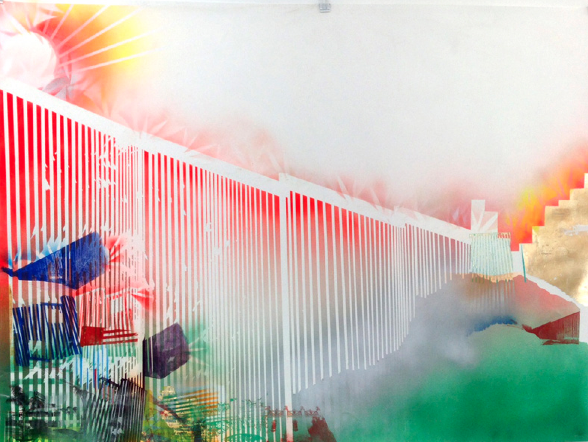 Her work is exhibited widely, including recent projects for the Museum of Contemporary Art Cleveland, the Rockford Art Museum, Galerie Module Drei in Dresden, Germany and TJinCHINA Project Space in Tijuana, Mexico.